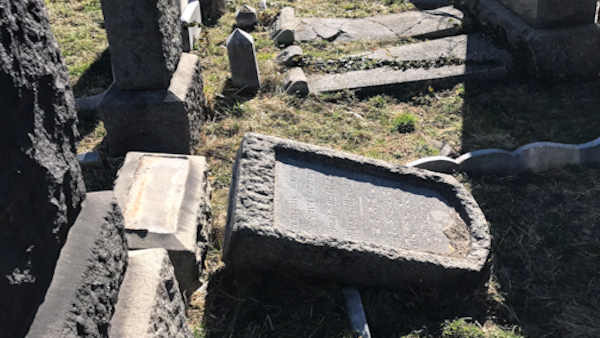 NEW YORK -- The NYPD has determined that gravestones damaged at a Jewish cemetery in Brooklyn were not vandalized. Police investigated the reports of possible vandalism at Washington Cemetery, a Jewish burial ground on Bay Parkway in Midwood. Investigators said the damage was likely caused by maintenance and environmental factors, and the cemetery operators concurred with the findings of the detectives. New York State Assemblyman Dov Hikind tweeted photos of the gravestones. Hikind said he was alerted Saturday night about the situation, saying more than 40 headstones were overturned, and was immediately in touch with the police to make certain that the matter was being investigated. An NYPD spokesman said the department's hate crimes division was notified of the headstones found toppled over at Washington Cemetery. There has been a wave of anti-Semitic incidents across the country, including other cemetery desecrations in St. Louis and Philadelphia.